S&P 500 finished the month strong with a 7.9% gain. This is the best S&P January since 1987. This is also the third January Trifecta in a row. Last year the S&P 500 crumbled in the fourth quarter under the weight of triple threats from a hawkish and confusing Fed, a newly divided Congress and the U.S. trade battle with China, finishing in the red. 2017’s Trifecta was followed by a full-year gain of 19.4%, including a February-December gain of 17.3%. 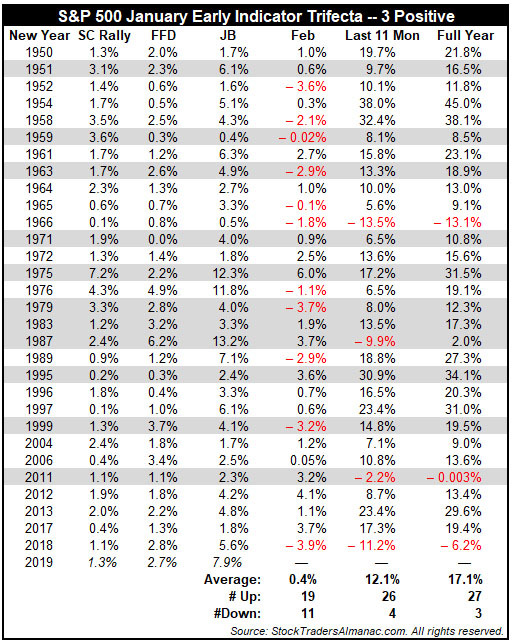 As you can see in the table below, the long term track record of the Trifecta is rather impressive, posting full-year gains in 27 of the 30 prior years with an average gain for the S&P 500 of 17.1%. Devised by Yale Hirsch in 1972, the January Barometer has registered ten major errors since 1950 for an 85.5% accuracy ratio. This indicator adheres to propensity that as the S&P 500 goes in January, so goes the year. Of the ten major errors Vietnam affected 1966 and 1968. 1982 saw the start of a major bull market in August. Two January rate cuts and 9/11 affected 2001.The market in January 2003 was held down by the anticipation of military action in Iraq. The second worst bear market since 1900 ended in March of 2009 and Federal Reserve intervention influenced 2010 and 2014. In 2016, DJIA slipped into a mini-bear market in January. Including the eight flat years yields a .739 batting average.